Lyn and Barry, a nice couple from the UK. 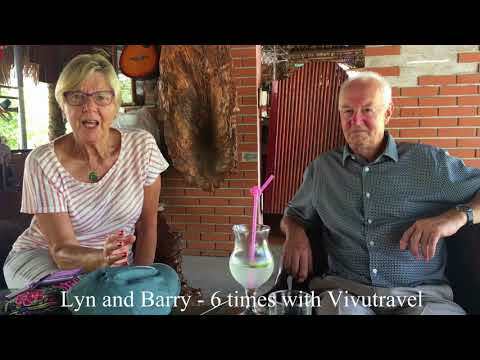 They love Vietnam and travelled 6 times with Vivutravel. Here are the places where they visited: Hanoi, Halong Bay, Ninh Binh, Duong Lam ancient village, Nom ancient village, But Thap pagoda, Mai Chau valley, Nghia Lo, Mu Cang Chai, Sapa, Y Ty, Bac Ha market, Ha Giang, Dong Van, Meo Vac, Ba Be lake, Ban Gioc waterfall, Hue, Hoi An, Ly Son island, Da Lat, Ho Chi Minh city, Cu Chi tunnels, Mekong delta, Mui Ne, Phu Quoc island. The beauty and friendly people of Vietnam are the reasons why they just want to come back every year. Another thing is Vivutravel is like their friend and home in Vietnam.